Many people love quotes. And they have good reason to do so because quotes are crisp, they are memorable and profound. By God’s grace, I coin quite a few almost daily as I write on diverse issues. I would love to compile and categorise them sometime. I actually started to do that a while back and issued some in the post below. Today, I present ten sayings about God for you to ponder on. (There is so much to be said about and on behalf of God.) I have included the titles of posts they were lifted or modified from where that is the case so you can check them out, perhaps, and see how the thoughts were further developed. Tell me what you think about the quotes in this collection and watch out for more of such posts from edithohaja.com. You are blessed! 1. 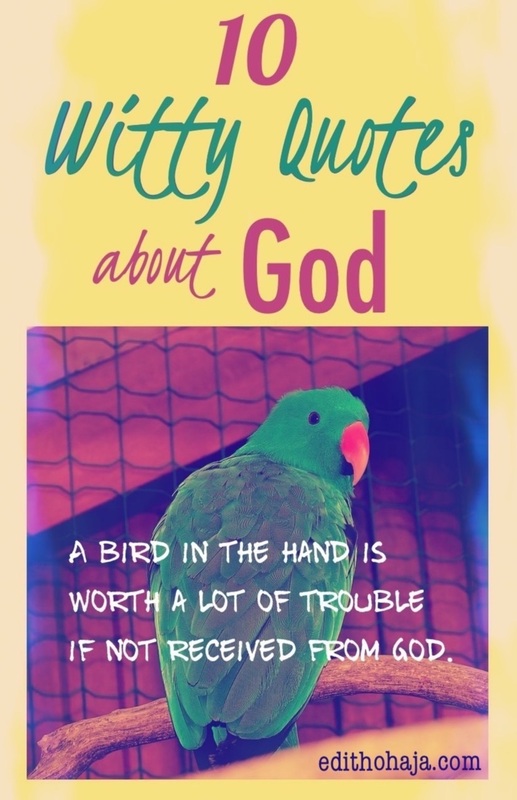 A bird in the hand is worth a lot of trouble if not received from God. 2. God is vast and layered in mystery. It’s impossible to pigeonhole him. 3. You have an infinitesimal fraction of eternity to spend on earth. With God’s help, you can make it count. 4. Worship of God is not a currency for buying yourself good health, easier circumstances and wealth. 5. A proper relationship with God is not a business transaction without emotional commitment. 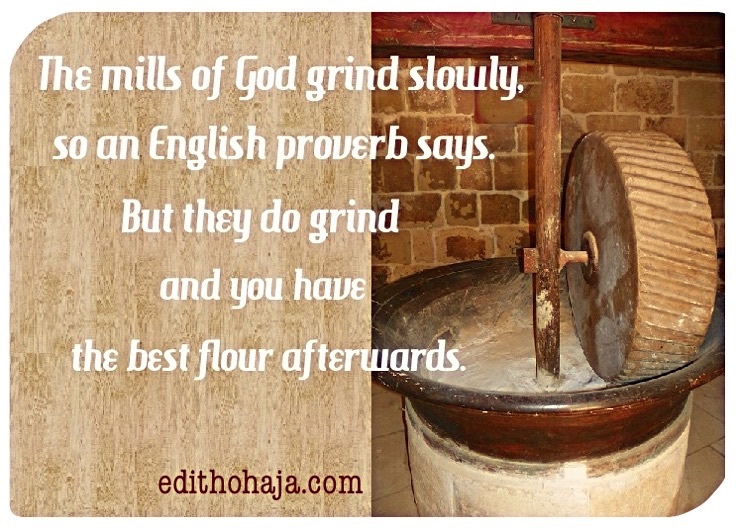 The mills of God grind slowly, an English proverb says. But they do grind and you have the best flour afterwards. 6. If we want to be a blessing on the earth, we should put God in the saddle of our lives. 7. God’s principal tense is the past participle. 8. It’s easy to serve God in obscurity and want. The true test of love is if we still serve Him when we’re famous and rich. 9. There’s no unconditionall love, everyone is ok as they are, in God’s book. 10. Tomorrow holds a promise when it’s seen through the eyes of God. Wow......this is awesome, ma. But the one that captivates me the most is number three. Glory to God! May your life's journey be fulfilling in Jesus' name. Thought provoking quotes. I am really blessed. Thank you, ma. Glory to God. Glad to hear from you, Miriam. I trust that you and your family are fine. Praise God! Blessings on you and yours, Rita, in Jesus' name. Wonderful! I pray I will be an amazing writer like you. So that I will join in disseminating God's messages. U are really a rare gem. Awwww! What a nice thing to say. Praise the Lord! And I say a big "Amen" to your prayer in Jesus' name. The quotes are awesome but the one which drew my attention is quote number 8. People tend to remember God in times of need and when life becomes better they enjoy everything and forget Him. May we not be counted among those who do so in Jesus' name. 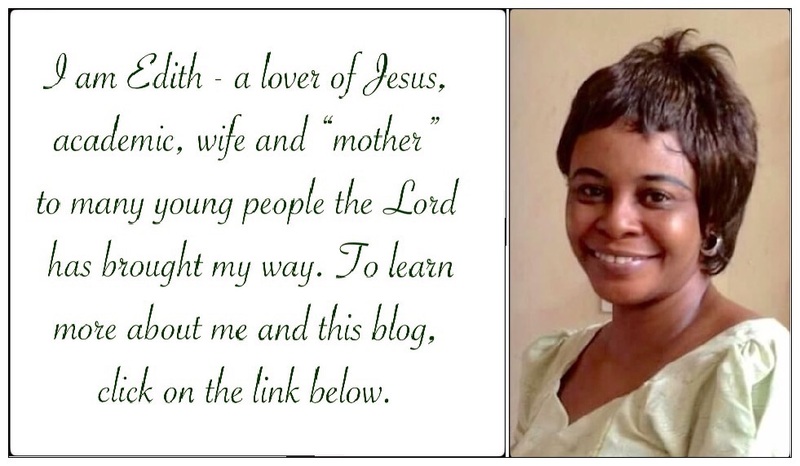 May you be awesomely blessed, Amarachi! These quotes are amazing. They boost our faith in God and help us to hold on tight to Him because with Him, all things are possible. Thank you very much, Emmanuel! I pray the quotes serve the purpose you mentioned in Jesus' name. You are soooo blessed! This post is really fantastic, ma. The 10 quotes are really awesome and true. It is important for people to read this post because there are so many things people don't know about God. There are also so many people that misunderstand God. This post is a good and true summary of God. Glory to God! I doubt that He can be summarised though. We can only talk of those aspects of Him that we have experienced. God bless you richly in Jesus' name, Chisom! Thanks for gleaning something from this, Charity. You are lifted in Jesus' name. I feel very inspired ma. What I really observed about these quotes is that they serve as an engine and a power house in our spiritual lives. It is said that the spiritual controls the physical and therefore our source should be problem free, to guarantee an obstacle-free and moral lifestyle. The spiritual does indeed control the physical. Bless you, John! I and most Christians out there need these quotes to push us more in believing in what God can do. Aunty, I must confess my optimum agreement with your number 8 quote which says it is easy to serve God in obscurity and want. But the true test of love is if we still serve him when we're famous and rich. It is at this point that man fail God because the rich will always have so many issues to attend to by reason of his wealth, position or status and might have little or no time for God. I pray such will not be my lot if God decide to bless me with riches tomorrow. Thanks ma for the wonderful quotes, they are indeed inspirational. Gods love for us is forever. He is our rock and fortress. God’s principal tense is the past participle. Made me chuckle. Very clever & funny quotes here. Tomorrow holds a promise when its seen through God's eyes.God factor is very important in all we do because he sees and knows the future..This is commendable ma! Wonderful,Quotes, Ma. You are indeed very creative. They are original as i have not heard exactly the same quotes any other place. I like the number 4 and 5. God bless you! These quotes are amazing and touching. It makes us know more about our God. we could go on and on but we will not be able to call all the attributes of God and his unconditional love for us. He is my rock and salvation and will always be. be blessed MA. No 4&5..hmm. So many Christians have forgotten that is an emotional affair. They feel all they have to do is sow a seed, they forget the worship of God which is very important. Many people always believe to get everything from God immediately they ask him .But we should worship him in spirit and in truth. God is an epitome of creativity, he's diverse, words are not even enough to describe him. When you put him first in your life, nothing can go wrong!